THE SOUMAK RUG - Soumak weaving is perhaps most fascinating for its integral incorporation of wefts. 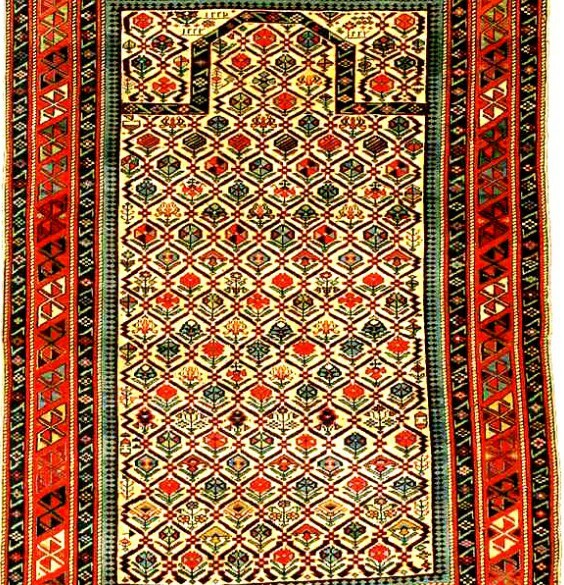 Soumak refers to a style of weaving as much as a place of origin, though the name does derive from the village of Shemaka, located in the rug-making center of the Caucasus. Indeed, the Soumak weaving technique is used heavily by tribal weavers of Caucasian rugs, but historically it is also found in tribal regions of Anatolia, Afghanistan, and southern and northwestern Persia. Employing an historic technique older even than traditional piled carpet weaving, Soumak weavers create flat-weave rugs that fall somewhere between traditional Kilims and knotted pile carpets. They work by wrapping each weft over four warps, then pulling the wefts back through first two warps, on and on in a repeated pattern until pieces as large as full-sized carpets are complete. It's a labor-intensive process, usually performed by an individual weaver, but the resultant Soumaks are stronger than their most closely related tribal form, the Kilim. They are somewhat less durable than piled Oriental carpets, but Soumak rugs are exceptionally finely woven, made in the utilitarian tribal tradition for daily use. Interestingly, unlike the Kilim, Soumaks are rarely reversible. Their undersides expose weft strands, sometimes inches long, and here we see evidence of their historic origin. The purpose of the unclipped weft strands is likely to provide additional warmth, for use during cold nights and long migrations to winter pastures. Soumaks, after all, are a truly native form--they are beautiful representations of tribal utilitarian art, central to the lives of semi-nomadic tribes. In design, Soumak weaving is perhaps most fascinating for its integral incorporation of wefts, unique among Oriental carpets. The wefts of Soumak textiles are not merely structural elements, but instead are woven visibly against the warp to create astonishingly elaborate, richly-detailed motifs, the best of which rival finely woven piled rugs in balance, coloring, and creativity. Tribal weavers of the form draw heavily on historic local symbols and geometric patterns, but typically also whimsically include tiny birds and geometric renderings of native animals in their final designs, either as accents or as central figures of the rugs. Of course when speaking of design we can only speak in generalities; Soumak, it should be restated, refers to technique rather than place of origin, and examples of the form have been found to draw on everything from Persian garden motifs to medallion motifs to palatial designs of the 16th century Persian Empire. Still, generalities can be useful, and not inaccurate, and among the varied designs found among antique Soumak rugs, the most common originate with the Shahsavan Tribe of modern day Azerbaijan and Northwest Persia. In the 17th century, the Shahsavan are said to have served as the personal guards to Shah Abbas during one of the most important periods in the history of Persian carpet making. 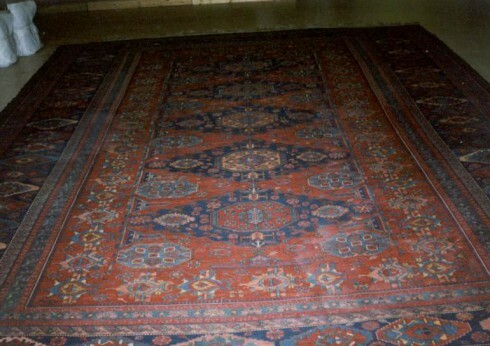 In the grand court of Abbas, they would have had unique exposure to some of the finest carpets in the world. Whatever the exact origins of its design, Soumak weaving has been used widely by nomadic tribes to create bags, saddle covers, bedding, and particularly strong floor coverings. Today, antique and vintage Soumak rugs, woven in soft wools and warm colors, sit beautifully in modern homes.